Ariel Re High School League Rugby Games took place at the National Sports Center with a double header involving CedarBridge and Berkeley. During the Girls 7′s, Cedarbridge Academy defeated the Berkeley Institute 27 – 5. The CedarBridge Academy got 2 tries from Camille Chin-Gurret and single tries from Lysmeiri Santana, Demiqua Daniels and Daesha Smith, while Emily Sinclair added a conversion. The Berkeley Institute”s lone try came from Cerise Woodley. 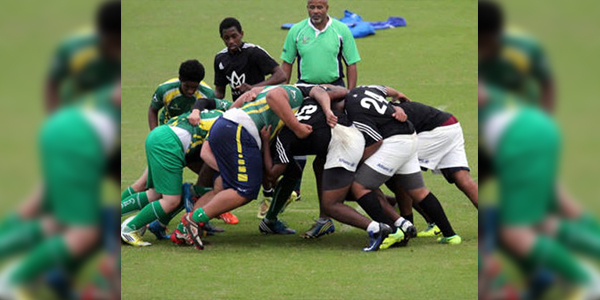 The Boys 15′s match needed extra time with the CedarBridge Academy defeating Berkeley Institute 17 – 10. CedarBridge Academy got tries from Payton Iris, Hussani Samuels and Djymon Reid with a conversion from Kellen Williams, while the Berkeley Institute got tries from Jahmali Bridgewater and Jahneiko Francis.